It was a blast to be back in St. Charles as part of Mission: Clean Stream, a county-wide clean-up event organized by Greenway Network. Greenway Network is a stream advocacy and restoration group that is celebrating their 20th Anniversary this year! We had 150 superb volunteers on hand to clean-up six miles of the Missouri River in St. Charles. It was a perfect spring day, a bit blustery but warm and sunny. 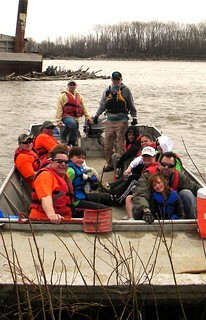 This was our 9th year hosting a Missouri River clean-up in the first Missouri capitol. You might think that after 9 years of cleaning up the same stretch of river we’d have it all done, right? Well it is definitely true that much old flood debris and illegal dumps have been removed forever. And what we call the “background noise” of old trash is greatly diminished. But each new flood pulse brings more trash, people unfortunately keep littering and, believe it or not, even after 9 years our hardworking volunteers do keep finding old flood debris that has not yet been removed. Cleanup veterans Janeen Sifford and Nate Guyton, co-workers at bioMerieux, found a backwater slough that was chocked full of huge tires and trash, apparently deposited in a flood quite a few years ago near the Hollywood Casino. Other volunteers worked along under the 370 bridge, finding some small dumps and bags of litter drifted down from the highway. A group of Ameristar employees scoured the beaches of Frontier park, cleaning up this most beautiful urban/river interface. 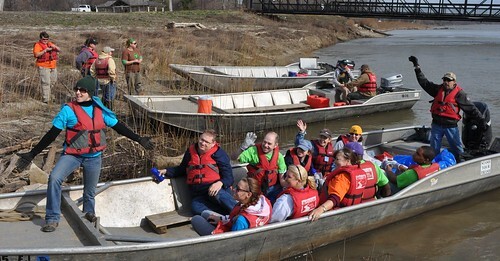 Most of these volunteers went out in boats piloted by Missouri River Relief crew volunteers and biologists from the Mo. Dept. of Conservation and the US Army Corps of Engineers. But we worked in tandem with the St. Charles Public Works employees, who had mapped out land sites for those that didn’t want to get out in boats. Immediately a lot of great work got done by all of these awesome volunteers giving up their Saturday to beautify their town and river. After the cleanup, we had a trash contest, where people brought in the most interesting items they found during the day. The “Best Darned Find of the Day” went to Shane Jordan, a manager for the Chesterfield Walmart who cleaned up about a ½ mile of riverbank by himself, only to find a scale model of the Ameristar Casino embedded in the mud that he then had to carry all the way back. A huge thanks to Carl and Chris from St. Charles Public Works for bringing their backhoe for a big trash haul and to Republic Services for supplying the dumpsters. Bridgestone/Firestone handled ALL the tires from the Mission: Clean Stream - kudos to them! These were entered by volunteers in the "Git That Garbage Trash Contest". Winners are in bold.